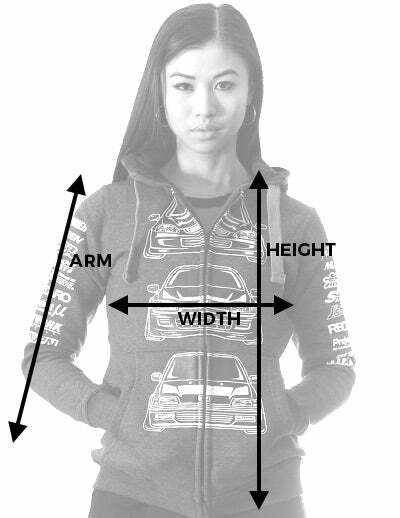 WIDTH 17" 18" 18½" 19½" 20" 21"
HEIGHT 22" 22½" 23" 24" 24½" 25½"
ARM 22½" 23" 23½" 24" 24½" 25"
Printed on a high quality tailored hoodie, it features the Subaru WRX STi GC, GD, GR & GP and also includes the history of Subaru in Japanese on the rear. Absolutely amazing fit and the price is justified with the high quality. I can see myself getting many years of wear out of it! I absolutely love my gear! Great customer service, every email I sent was responded to within the hour! Thank you guys so much! Will definitely be back for more! Loved it! Can’t wait to buy more from you! *UPDATE* LOVE THE MATERIAL AND THE PRINT! so as I looked at the hoodie cover, I realized that the picture depicted above as of Nov 5 2017 is of a different jacket than that of which I received. The Japanese text on the back of the jacket sent to me is almost invisible unless you tilt it just the right way in the lighting, the jacket is also a light gray versus the dark gray shown. I emailed and they responded quickly which I was very happy about! However I believe that HardTuned should have noted or updated their photos as soon as they were going to start sending out the new look.